Oh, Honda Civic, how I love thee. 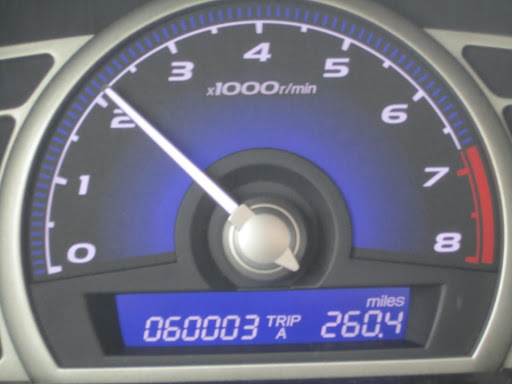 Today on my odometer, you read sixty thousand and three. Through tornadoes and blizzards, and all sorts of weather. So much crying, in fact, that I am judged by my peers. But Honda, you never judge my state of being! And you’ve seen them all – experienced more than the boy that I’m seeing! And yet you still start, so your wheel I can steer. And you never judge me, like other drivers that look in my window, by chance. You just keep cruising along, even when Peter tells me that through my windows, they can see. Unlike Peter, you don’t scold me, with “I told you so” eyes glaring. and that was last weekend, when it was raining/snowing like sin. It wasn’t your fault, it was the blasted windshield wipers! They wanted to be in control, those jealous vipers!! They suddenly took on a mind of their own. Even turned off, they still ran full blown! I tried controlling them, tried every speed! But those damned wipers just had to have the lead! but the rain didn’t last, so the wipers I didn’t need. and my wipers were going – oh what a pain. I looked like an idiot, and those wipers weren’t slowing. Those wipers, I SWEAR, I heard those wipers scoff. That’s like driving around the world along the equator times two point for-tee!! Especially when I am not buckled, and you let out a beep. Because I can’t find the song that gives my voice full power. I’m so happy that even though I don’t want to pay for a car wash, you still drive without a fight. When I am about to faint because that door will be my demise. And I was going to be late and look like a slob! I was very near to giving up hopin’. Sweating so much – I couldn’t be late!! You started with a purr, by the garage door you won’t be beat! You stay so calm – for this I should strive. And you just keep going, driving along so well. You do not mind when on the phone I chat. Except when annoying children can see I’m going one mile over and don’t shut up about it, then I wish you weren’t bright. Nasty little children, spilling ice cream on the seat belt! Leaving crayons, candy, and crumbs on your floor, how horrid that must have felt! I will pay for a detail – I will give you my praise!! I’ve learned to accept it; I’ve learned to get smart. I have still decided to write this ode to thee. So PLEASE, Honda Civic, don’t crap out on me until I’m really, REALLY wealthy. I guess we shouldn't have soooooooo many miles on it when you were in Equador. Sorry!